Career development in the 21st century presents many challenges and opportunities to adults. They must now navigate a complex and rapidly changing world of work influenced by technology, globalisation and fluctuating economic conditions. The My System of Career Influences (MSCI) (Adult) is a qualitative career assessment tool based on the constructivist theory from cognitive psychology. Acknowledged as the third wave in cognitive science after psychoanalysis and behaviourism, constructivism emphasises the individual in the assessment and counselling process. Individuals actively participate in the construction of their own reality and are encouraged to respond to and deal with both anticipated and unanticipated events that influence their careers. This book describes the Systems Theory Framework of career development that provides the theoretical background to the MSCI as well as a step-by-step user guide to conducting the MSCI (Adult) process using the MSCI (Adult) Workbook (sold separately). 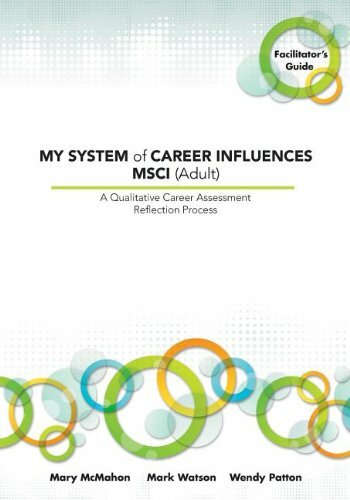 With its attention to an holistic and storied approach to career intervention My System of Career Influences (MSCI) (Adult) is an essential resource for all career practitioners working with adults in todayÃ¢ÂÂs workplaces.